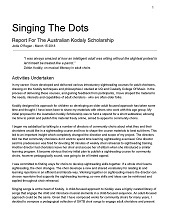 The National Council of the Kodály Music Education Institute of Australia is pleased to present the project report and outcomes of the inaugural 2016 Australian Kodály Scholarship. Jodie O’Regan has produced a tremendous resource that embodies the Kodály philosophy and music for all. Singing the Dots aims to develop musicianship and music literacy in adult community choirs. Featuring a Foreword by Dr James Cuskelly, this resource provides a valuable contribution to community singing and music education. Many choristers know being able to read music would improve their experience in choir, but singers come to choir to sing. It can be hard to find time, enthusiasm and suitable material to work on music literacy. 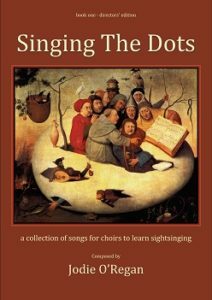 With Singing The Dots, choristers can develop musicianship skills through singing songs together, immediately connecting sightreading to real choral repertoire. The songs are composed for adults. The ranges are comfortable and the words are settings of beautiful, well known poetry. Musical elements are introduced one at a time, with simple explanations and short, lighthearted exercises. The material is crafted to be practical and accessible, and adapts the highly successful Kodály approach to the needs of adult choristers. Choirs are welcome to use Singing The Dots to focus on explicitly developing musical literacy or simply as a collection of songs to sing. The material can stand alone, or be used in conjunction with other musicianship training.